The Royal Military College of Canada offers a professional military education to officer cadets in the Canadian Forces. Unlike military training, which focuses on the development of concrete skills, military education involves the professional preparation of officers to lead armed forces effectively in peace and war1. As in other fields like medicine, law, or engineering, the history of military education over the last 150 years, in Canada and elsewhere, parallels in many ways the evolution of military service as a profession. Military education in this period became a vehicle to convey to officers and officer cadets a body of specialized knowledge. Its mastery would provide a firm foundation in military theory and analytical and communications skills in addition to the soldier’s historic training in technical or combat-related subjects. In this, the history of military education is also related closely to the development of civilian educational institutions and the broader social, cultural, and political pressures to which the latter necessarily respond. This was as true in mid-nineteenth century British North America as in contemporary Canada. The Confederation, or union, of several British North American colonies in 1867 as the Dominion of Canada occurred amidst some concern over the new country’s military security and the state of its armed forces. Recent developments such as the proliferation of rifled small arms and artillery, the increased use of railways for military transportation, and improved communications through the electric telegraph, had affected dramatically the conduct of war, as demonstrated by the American Civil War (1861-65). They also placed additional demands on the training of military personnel. While Canadian leaders remained committed to the amateur citizen militia, a centuries’ old tradition, as the country’s first line of defence, they nonetheless concluded that enhancing the professional preparation of officers would strengthen the militia. 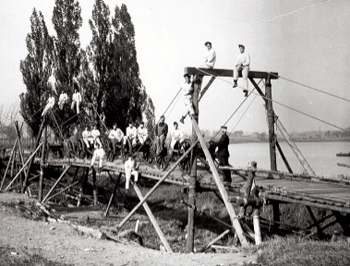 In 1864-65, special schools opened in six Canadian cities to train militia officers run by the British garrison’s professional soldiers; the militia continued to operate these schools after British troops withdrew from Canada in 1871. In 1867-68, Ottawa also established permanent schools at Kingston and Quebec to train gunners for the artillery. Together with similar infantry and cavalry schools created in the 1880s, these formed the basis from which a small Canadian Permanent Force slowly emerged. But the courses offered were short-term and mostly concerned with the technical operation of running units. In his annual Militia Report of 1873, the acting adjutant general, Colonel Walker Powell, drew attention to the need for a different type of school, one that offered education in a “higher class of duties and capacity for superior command” and which would require a more prolonged course of study. This could only be secured, he argued, by sending Canadian officers to study at military schools in Great Britain, or else by opening such a school in Canada. As part of a broader program to strengthen Canadian-British ties, the Earl of Dufferin, governor-general since 1872, likewise supported a reformed militia and the creation of a military college. The latter, Dufferin believed, would supply a much-needed core of military professionalism to Canadian forces and help perpetuate British values in the new country. 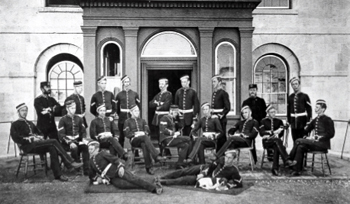 Dufferin did not believe that a British military college could simply be recreated in the conditions of colonial Canada. Earlier, he had chaired a Royal Commission on military education in Britain. It had commented favourably upon aspects of the program at the United Sates Military Academy at West Point, New York (founded 1802), especially its provision of instruction in the engineering and artillery branches alongside the infantry and cavalry. In 1873, Dufferin’s private secretary, Colonel Henry Fletcher, reported that West Point’s new-world democratic traditions were more appropriate for Canada than those of more “aristocratic” British institutions. West Point accepted candidates from all levels of American society by means of a relatively easy qualifying exam-ination and formed them into officers through a rigorous four-year program of study centered around mathematics and engineering. His additional conclusion that the West Point system was the cheapest method of producing officers could not help but appeal to economy-minded Canadian politicians. Prime Minister Alexander Mackenzie (in office 1873-78), though committed to reducing defence expenditures, was also a former militia officer well aware of the force’s deficiencies. Encouraged by political allies and fellow militia officers like Toronto’s George T. Denison, Mackenzie concluded that the comparatively small expend-itures required for a military college would constitute a sound and inexpensive investment in the nation’s future military security. His government proposed a bill, passed by the House of Commons on 15 May 1874, to create a college “for the purpose of imparting a complete education in all branches of military tactics, fortification, engineering and general scientific knowledge in subjects connected with and necessary to a thorough knowledge of the military profession and for qualifying officers for command and staff appointments.” It was located at the confluence of the St. Lawrence River and Lake Ontario in the old garrison town of Kingston, and commanded by Lieutenant-Colonel Edward Osborne Hewett of the British Army’s Royal Engineers, a man of “high scientific attainments” as well as an excellent military officer. It welcomed its first group of cadets, known ever since as the “Old Eighteen”, on 1 June 1876 and received permission from Queen Victoria to call itself the Royal Military College of Canada (RMC) in 1878. Although West Point was the model, British military tradition was paramount. The staff was mostly British, the uniform and parade-drill were (and are) British-inspired, and, until the 1950s, the strategic and tactical doctrine underlining the curriculum was British as well. Proponents of RMC had noted the fact that, at least before the Civil War, most West Point graduates spent only a short time in the army before returning to civilian life. As civilians, the ex-cadets played an important role in building the roads, bridges, and harbours that were fundamental to America’s rapid economic development in the nineteenth century. The new Canadian college, they argued, could play the same role by formulating its courses in such a way that they would be equally applicable to civilian and military endeavours. This would help compensate for the inability of civilian schools to produce sufficient quantities of engineers and other professionals. RMC‘s curriculum would include military administration and law, strategy and tactics, arms training, parade drill, and the involvement of the cadets themselves in maintaining daily discipline. Physical well-being and group spirit would be promoted by a strong emphasis on athletics. 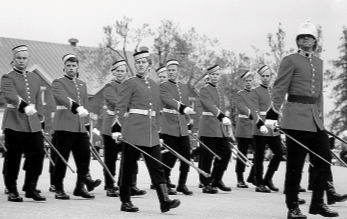 During its early decades, most RMC ex-cadets who wished to pursue a full-time military career did so within the British service, which kept several commissions open for RMC graduates. By 1894, 84 were serving with British or other imperial forces, whereas only 10 had joined the tiny Canadian Permanent Force. This began to change after the South African War (1899-1902) as result in part of efforts by Sir Frederick Borden, the minister of militia and defence from 1896 to 1911. Between 1911 and 1914, 19 of 123 RMC graduates took up imperial commissions but 23 accepted commissions in Canada’s Permanent Force. The rest returned to civilian life. In the inter-war Permanent Force, slightly larger than its pre-war predecessor, professional qual-ifications gradually replaced political patronage as the chief means of officer appointment in peacetime. More RMC graduates joined the Permanent Force as a result. By the end of the Second World War (1939-45), they dominated the military’s senior ranks. All four of the officers who became Chief of the General Staff during the war were former cadets as was General H.D.G. Crerar, commander of First Canadian Army in Northwest Europe. In all, 1420 ex-cadets, or 80 per cent of those available, either served in the forces or took up special war work. More served with the Royal Canadian Navy and Royal Canadian Air Force than previously, but the majority (901) served with the army, as the college was still mostly geared to producing army officers. Although again few compared to the total number of officers required, RMC graduates were proportionately numerous in command positions. In 1942, RMC closed as a cadet college, its facilities used for purposes deemed more immediately relevant to the war effort. When it finally re-opened in 1948, after the government had taken time to consider the future of the whole defence establishment, it was to be a remarkably different institution than before. It was now to be officially tri-service, producing officers for the navy and air force as well as for the army. In 1952, the government introduced the Regular Officer Training Plan (ROTP). This was intended to ensure an adequate supply of officers for the comparatively large forces Canada expected to maintain during the Cold War. The government undertook to pay the fees of all cadets in return for a promise on their part to serve for at least three years (later extended to four). No longer would most RMC graduates go into civilian life, from which they might or might not be called upon to serve. Now they would all go into the military on graduation, with an expectation that many would opt to stay longer than the minimum period. These changes reflected in part the gradual evolution of Canada’s military from a citizen-based militia with a small professional cadre, to a larger professional standing army with a more limited militia component. The post-war history of the college also reflected broader developments in Canadian society and political institutions. The Official Languages Act of 1969 made the college officially bilingual and led to higher enrollment by French-speaking Canadians. Women, who first entered the college as cadets in 1980, constituted 27 per cent of the student body at century’s end. As important to the post-war face of the college was a change in curriculum. This was largely the work of the director of studies from 1948 to 1967, W.R. Sawyer, an ex-cadet, Harvard-educated chemist, and chemical warfare officer with the Canadian Army. Sawyer had concerns about what he saw as the pre-1939 college’s narrow technical bias. He believed that what the modern military officer needed most was the capacity to think conceptually and creatively about complex issues, a requirement that demanded a wide range of course options and a more challenging intellectual experience. Conse-quently he not only strengthened the science program, but introduced new courses in English, French, history, politics, and economics and hired competent staff to teach them. In this way, argued Sawyer, RMC could attract students of the same quality as those entering the civilian university system. The difference would be that cadets would receive a much more thorough grounding in both science and the arts than their civilian counterparts. All cadets would take the same courses in both programs in their first two years, after which they would specialize in their preferred disciplines. In 1959, RMC became a degree-granting institution and today offers B.A., B.Sc., and engineering degrees, along with honours and graduate programs. After 1952, RMC was the flagship of a triad of military colleges that included Royal Roads in British Columbia (founded 1942) and Collège militaire royale de Saint-Jean. When the latter two were disbanded due to government economy measures in 1995, RMC resumed its position as the only Canadian military college. A wide-ranging debate in the 1990s over leadership, academic training, and the profession of arms in Canada resulted in curriculum changes, enhanced outreach programs, and increased links to civilian universities, which reaffirmed the college’s role at the centre of Canadian military education. As part of this process the college placed renewed emphasis upon its program’s military component as well, especially in the areas of leadership and military ethics. Today, RMC‘s primary role remains to “educate and train officer cadets and commissioned officers for careers of effective service in the Canadian Forces”, but it still comes closer to the civilian university model perhaps than most other contemporary military colleges. This reflects a continuing balance in Canada’s military educational tradition between military requirements and civilian influence. 1 John Whiteclay Chambers, III, The Oxford Companion to American Military History (New York, 1999), p.243. Canada in the Great War, Volume VI, Special Services, United Publishers of Canada, np. 1920. Sean Maloney, War Without Battles: Canada’s NATO Brigade in Germany 1951-1993, McGraw-Hill Ryerson, Toronto, 1997. R.G. Moyles, The Blood and Fire in Canada: A History of the Salvation Army in the Dominion 1882-1976, Peter Martin Associates Limited, Toronto, 1977. C.P. Stacey and Barbara Wilson, The Half-Million: The Canadians in Britain, 1939-1946, University of Toronto Press, Toronto, 1987. Scott Young, The Red Shield in Action, The Salvation Army, Toronto, 1949. Clarence D. Wiseman, A Burning in My Bones, McGraw-Hill Ryerson, Toronto, 1979.